I like the glass globe in the first picture. It looks interesting and old to me. Yes I do realize that this is not an 1937 light globe. I do plan on reusing it when renovations are redone. 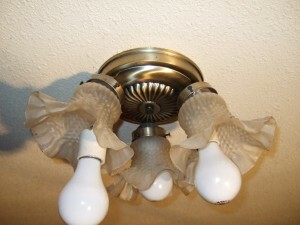 It will help give the house an older feel and of course save a few dollars. The second light fixture I am going to keep also. Well maybe one that is in better condition. Lee doesn’t like it as much as the globe. 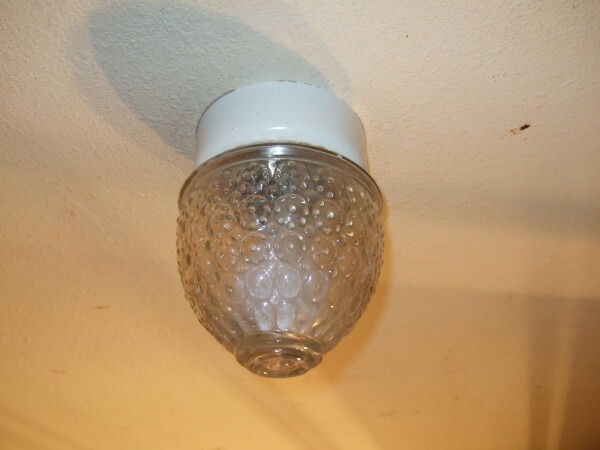 But he told me that it was because almost every light fixture in the house is this one. Guess they got a good deal or lacked creativity or they were the cheapest they could find at the time. 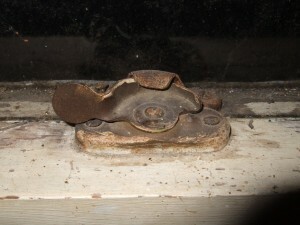 The third picture is the window sash weight. Its pretty neat looking. Almost all the the old windows sashes still work. I don’t know that I had ever seen one before. The fourth picture is the window latch. So very neat. We are talking a lot about whether to replace the windows or keep them. This entry was posted in Historical. Bookmark the permalink. Hi, Lee & Robin! You are doing a GREAT job. From “being there, done that, and didn’t get a T-shirt”, Denene and I really understand what you as “House wreckers” :-)) Heh! Heh! are going through… I have one suggestion for you at this time. And to be sure, it is just a suggestion. It’s Your Home and your money, and no matter what some of Your new neighbors on Jasper Park Road may think you should do with it, I fully believe in NOT “Should-ing” on others or myself!!! The suggestion: Replace the Windows with New Vinyl double pane, low-E windows. You can order them to the original size opening and jam width in most cases. A good friend of mine ran his own business called “Green Houses, Etc.” in California for many years. His name was also Lee. I replaced many old wood double-hung 1934 windows in our first “Fixer-upper” home in CA with Marvin ones and they gave us good service and increased the livability and value of that home. They have a small show room of the windows and doors they distribute at 2630 W. 7th Pl., in Eugene. They order/sell windows and doors from CertainTeed, Jel-Wen, Summit, & Phillips Vinyl, and Marvin, Lincoln, & Anderson Wood windows in every style. I went with CertainTeed High Performance Windows – Auburn Series # 400, (LoE, Argon Fill, Vinyl with grids) One reason was because the CertainTeed line of narrow profile that fit perfectly right into the old window rectangles with no extra carpentry or wall structural changes or additions and aligned exactly right with a 1″x6″ Ceder wood frame around each. Another reason was for their excellent Sound Insulation qualities. (I have a very noisy large gas powered electric generator which I used to test the Window and Patio Door Sound limiting characteristics of my new CertainTeed windows and Vinyl Glass patio Door. I parked the generator about 15 to 20 feet from the Dining room Sliding Door and Kitchen window and fired it up. I went inside the house and video taped through the door and listened, but the wispering refrig compressor in the kitchen was louder than any noise getting through the window or door from the noisy generator!). I found Mid-Valley easy to deal with and had the custom CertainTeed windows and door drop shipped to my location, and had a good private contractor install them, but if I were younger I’m sure I would have elected to install the windows myself. Just a suggestion. PS- I do NOT recommend the Viking Brand of windows that Jerry’s Home Improvement stores carry. Just about everything else Jerry’s sells is okay to Good. Viking are Low Quality, cheaply built, sub-standard windows in my personal opinion, for what it’s woth. Cheers, Drew R.
Thanks for the suggestions and the local supplier reference. We will definitely follow up with them. We have been vacillating on replacing or refitting the windows for some time. 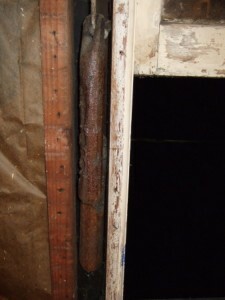 Refitting an old window can bring it up to about R1, but new windows can achieve R3 or R4. Since our goal is to super-insulate the house as part of the renovation, we were slowly coming to the conclusion that it would be silly to do this while keeping the leaky single paned glass. Your comments serve to reinforce this viewpoint. I’ll keep the existing windows that are salvageable. Properly weatherized, they’d be fine for a barn or workshop. Thanks for stopping by our blog! I know this is an OLDDD comment I found… but I had yo jump in! Lee, you mentioned a metal shingle roof – did you put up a metal shingle roof already? That is one thing Randy & I have been discussing in detail – we currently have a metal shingle roof in need of repair & we’d like to keep the place looking historical. Le me know if you did this & how it went, if you don’t mind! We are interested in metal roofing because of the environmental friendly aspects. It lasts longer than shingles, can be recycled at end of life, and keeps your house cooler. I really like the metal shingle products because they have a nice old-fashioned roof look but with modern metal finishes. Unfortunately, I think metal shingle is a little out of our price range. We looked at Zappone and Classic Metal Roofing. Zappone aluminum shingles run about $300/square including trim and fasteners. Compare this to standing seam metal roofing, which runs about $170/square, or 40-year asphalt for ~$80/square. My book on obsessive restoration of bungalow exterior details talks about original metal shingle roofs. It doesn’t offer any easy solutions though. If you’ve got leaks and need replacements, it suggests finding another roof of the same time period that might be getting torn off, or having a local company mill out replacement shingles. Photos include round singles and other designs that I’m sure would be very rare and hard to replace. Sounds like an expensive route any way you go. Copyright © 2019 Farm Folly	All Rights Reserved.